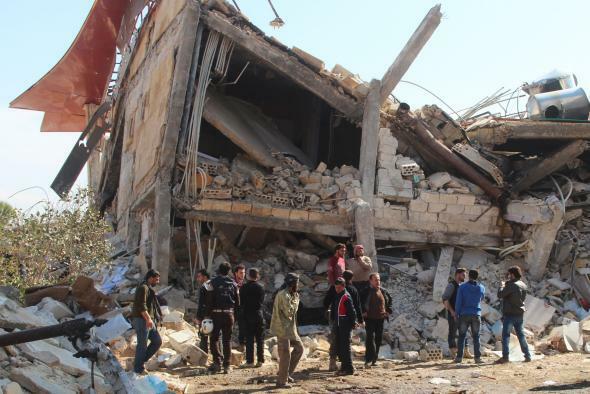 Air Strikes destroy three hospitals in Syria, kill dozens of civilians. People gather around the rubble of a hospital supported by Doctors Without Borders (MSF) near Maaret al-Numan, in Syria’s northern province of Idlib, on Feb. 15, 2016, after the building was hit by suspected Russian air strikes. Airstrikes in Syria destroyed three hospitals on Monday, including one affiliated with the international medical charity Doctors Without Borders. The charity said at least seven people were killed by four missiles dropped during two air raids carried out within minutes of each other and eight more were missing, presumed dead. The death toll across the three attacks is at least 23 civilians so far, Reuters reports. The bombardment comes just days after diplomats, lead by John Kerry and his Russian counterpart Sergei Lavrov, announced an international agreement on a “nationwide cessation of hostilities” in Syria. The impact of the deal was far from certain from the moment it was announced, and a less charitable parsing of the agreement shows it could allow Russian and regime forces to solidfy their military gains, as well as cherry pick who is considered a terrorist organization—on which the accord allows attacks to continue—and who are opposition forces battling the Russian-backed Assad regime.